Sialadenoma papilliferum (SP) is a rare benign salivary gland neoplasm, and it comprises <1% of minor salivary gland tumors. The mean age of patients is 59 years (ranging from 32 to 87 years). There is a male predilection with a male-to-female ratio of 1.6:1. The most common location is hard palate (80%) followed by buccal mucosa, upper lip, retromolar pad, and parotid, and it usually does not exceed 2 cm in diameter. Although the clinical feature of SP is similar to squamous papilloma, it is not related to the human papillomavirus infection. The most common provisional clinical diagnosis of the lesion is squamous papilloma. The purpose of this paper is to report a new case of SP of the hard palate in a 50-year-old woman. A 50-year-old woman was referred to a private oral and maxillofacial pathology center (Tehran, Iran) for the evaluation of a painless, reddish mass with slightly papillary surface in the left posterior side of the hard palate which had been presented for 1 year [Figure 1]a. She complained of roughness of the lesion surface. There was no history of previous trauma, and the patient had no other medical problems. Extraoral examination was normal. The mass was firm in consistency measuring 1 cm × 1 cm × 0.5 cm. There was no cervical lymphadenopathy, and routine laboratory investigations were unremarkable. According to clinical features, salivary gland tumors, hemangioma, and papillary lesions such as squamous papilloma and warty dyskeratoma were considered in differential diagnosis. Excisional biopsy was performed under local anesthesia. The specimen demonstrated a solid, white, and homogenous cut surface with papillary projections and was processed for routine hematoxylin and eosin histopathologic study. Microscopic examination showed a salivary gland tumor with biphasic growth pattern composed of multiple exophytic papillary projections that were covered by stratified squamous epithelium. The epithelium was contiguous with a proliferation of papillomatous ductal epithelium found below the surface and extending downward into the deeper stroma. Ductal structures were lined by two layers of columnar and cuboidal cells [Figure 1]b and [Figure 1]c. Chronic inflammatory cells were seen in the connective tissue. There was no evidence of mitotic figures or cellular atypia. The microscopic feature was consistent with the diagnosis of SP. Clinical follow-up was performed after conservative surgery, and the patient was free of tumor for 2 years postoperatively. SP was designated primarily in 1969 by Abrams and Finck. Since its description, about 62 cases have been reported in the English literature. The pluripotent myoepithelial cells, the excretory duct reserve cells, or the intercalated salivary ducts were considered as a cellular origin. However, most researchers believe excretory duct or excretory duct reserve cells as a source of SP. This neoplasm has both a surface squamous and a underlying ductal element. It probably originates from ductal epithelium adjacent to the junction of surface mucosa. In addition, SP has different cell types such as squamous, myoepithelial, and ductal. Therefore, it may have origin from excretory duct reserve cells with the potential to differentiate into the three cell types. SP usually presents as a white exophytic, asymptomatic, slow-growing mass with papillary surface. However, in our case, the lesion was red. In Fowler and Damm's review of SP cases, about 28.5% of the lesions were red, and in several cases of SP, the clinical diagnosis was hemangioma. Microscopically, SP is well circumscribed but unencapsulated. It shows a biphasic growth pattern composed of multiple exophytic papillary projections that were covered by stratified squamous epithelium combined with ductal proliferation. The ductal structures are lined by a double row of cuboidal or columnar cells that form small papillary infoldings into the ductal lumina. The ductal cells occasionally have an oncocytic appearance. Scattered mucous cells also may be seen. An inflammatory infiltrate of plasma cells and lymphocytes is characteristically present. The histopathologic features in our case achieved the criteria for diagnosis of SP. Microscopic differential diagnosis consists of intraductal papilloma, inverted ductal papilloma, and papillary cystadenoma. Diagnosis is based on histopathologic features, and immunohistochemistry is not helpful. However, investigations showed that the lesion has positive immunohistochemical expression for cytokeratins 13, 14, 7, 8, and19 and is negative for vimentin and smooth muscle actin. This immunoprofile is similar to excretory ducts of the salivary gland. SP shows limited growth potential and has an excellent prognosis. Conservative surgical excision is the treatment of choice and the recurrence rate is low. Malignant transformation has been reported., However, Fowler and Damm mentioned that there was insufficient evidence in the publications to support origin of salivary gland malignancy from preexisting SP. In case of a palatal mass with papillary surface in an adult patient, SP should be considered as one of the possibilities. SP is not encapsulated and it may histologically be confused with other lesions. Therefore, pathologists should be familiar with the histopathologic characteristics of this rare lesion to prevent unnecessary treatment. Mahajan D, Khurana N, Setia N. Sialadenoma papilliferum in a young patient: A case report and review of the literature. Oral Surg Oral Med Oral Pathol Oral Radiol Endod 2007;103:e51-4. Fowler CB, Damm DD. 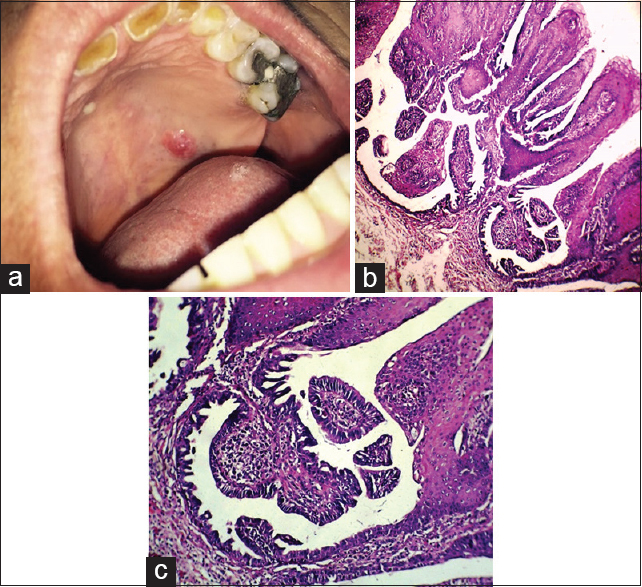 Sialadenoma papilliferum: Analysis of seven new cases and review of the literature. Head Neck Pathol 2018;12:193-201. Loehn B, Sutton C, Jastram-Belcher J, Harton A, Anderson D, Walvekar RR, et al. Sialadenoma papilliferum of the parotid gland: Case report and review of literature. Head Neck 2013;35:E74-6. Gomes AP, Sobral AP, Loducca SV, de Araújo VC. Sialadenoma papilliferum: Immunohistochemical study. Int J Oral Maxillofac Surg 2004;33:621-4. Ide F, Kikuchi K, Kusama K, Kanazawa H. Sialadenoma papilliferum with potentially malignant features. J Clin Pathol 2010;63:362-4.